Lamp Light Games announces the Relaunch of Space Junk on Kickstarter. Read on for more info! Use all manner of Space Junk to Build, Laugh and Smash your way to victory in this fun easy to learn game! I would say the most innovative part of Space Junk is building your ship. There are other games that use ship building as a mechanic, but use a generic set of parts with multiples of the same part. So the players will have some of the same items as each other. *In Space Junk every item is unique, you will never have even one item the same as another player. Space Junk is a game set in the future where the players are contestants on the hit reality TV show, Space Junk. The object of the game is to win the big fat cash prize, by being the player who earns the most Fame throughout the course of the game. The game is played over six rounds each consisting of 3 phases: Move, Attack, and Search. You earn fame points by: Completing orbital laps around the earth, successfully attacking other players, and by collecting various junk items. During the movement phase you move your ship around the board scoring points for each lap completed. In the attack phase you launch an attack on another player scoring 3 points for each successful hit. In the search phase players draw new junk cards and redesign their ships for the next round. After six rounds players add the fame points on all the junk cards they have collected to what they gained throughout the game, and whoever has the highest total wins! Also stay tuned for a review from Club Fantasci in the very near future! Congratulations to Alex Pualani! You have won the copy of 1775 Rebellion from Academy Games! We hope you enjoy it! Club Fantasci wants to give you a chance to win this amazing game from Academy Games! The contest runs starting 12:00am Dec 30th, 2013 till 11:59pm Jan 31st, 2014. Good luck! Now you and your friends command the armies of the British Redcoats, English Loyalist, German Hessians, American Regulars, Patriots, French Regulars and Native Americans to decide the fate of the Americas. Players from each faction cooperate to gain control of key towns and forts. Share the fun in this light and fast paced multi-player game! Academy Games, the publishers of ‘1775 – Rebellion’, ‘Freedom: The Underground Railroad’, and the award-winning Conflict of Heroes series, is launching a new Kick Starter! ‘Fief – France 1429‘ is a game of dynastic ambition, where players assume the roles of nobles in the 15th century Kingdom of France. Each player strives to become the most powerful ruling force in the kingdom by gaining control of Fief and Bishopric territories. In turn, they acquire Royal and Ecclesiastical (church) titles which give their families influence in elections for the next Pope and King. Players strengthen their positions by negotiating marriage alliances between their families, setting the stage for love, treachery and deceit! Fief is a French language board game classic and is being re-introduced by Academy Games in English with updated rules, cards and map board. This edition includes additional components, which enhances game play. Catalyst Game Labs Announces the Shadowrun Introductory Box Set Being Split Into Two Great Box Sets! As part of the Year of Shadowrun, Catalyst Game Labs announced a Shadowrun Introductory Box Set, which would be the first ever “starter” box for Shadowrun. Unfortunately, as happens to us sometimes, our passion got the better of us, and right as we were ready to send it to print we realized it was trying too hard to do too many things. This split allows both boxes to focus on a single primary objective, as opposed to the jack-of-all-trades syndrome plaguing the initial box. The Beginner Box is 100% about new players, providing an easy-on-the-wallet quick taste of Shadowrun, making the barrier of entry into the game lower than it’s ever been. Meanwhile the Runner’s Toolkit: Alphaware can focus on helping existing players obtain a variety of useful tools for easing into multiple adventures of Shadowrun, Fifth Edition, while also acting as the perfect bridge product for new players between the Beginner Box and Shadowrun, Fifth Edition. Note that because we previously conducted a solicitation of the Introductory Box Set, we felt the only way to eliminate as much confusion as possible was to completely discontinue that name. And the use of the Runner’s Toolkittitle with the Alphaware suffix sets up the eventual publication of Runner’s Toolkit: Betaware, the Shadowrun, Fifth Edition version of the spectacularly sellingShadowrun, Fourth Edition Runner’s Toolkit. Finally, to help maximize retailer (and ultimately the community’s) understanding of this change, we’ve pushed both items back to spring releases to ensure a full 4-month solicitation cycle. Win a Copy of “Dread Curse” by Smirk & Dagger Games! Club Fantasci wants to give you a Christmas present! Enter here to win the new game “Dread Curse” from Smirk & Dagger Games and see if ye luck holds out this holiday season! “Before ye lies a sack of 60 golden doubloons. seven crew assignments, each with a unique talent for prying coins from the hands of their shipmates. be death itself. Best line someone else’s pocket with it, lest ye find yer pirating days at an end. Gale Force 9 Games Announces New Firefly The Game – Pirates & Bounty Hunters Expansion! Gale Force Nine has announced the release of Firefly: The Game – Pirates & Bounty Hunters, the first full expansion for its popular Firefly board game, in March. Pirates & Bounty Hunters introduces a lot of player-vs-player interaction to the game. Players can raid rivals’ ships cargo with piracy jobs, or hunt down wanted fugitives (or other players’ crew) for bounties. The expansion also includes new Supply and Story cards, two new Leaders, the new Bounty deck, and two new ships. MSRP is set at $29.99. Since the launch at Gen Con, Firefly: The Game has sold over 30,000 copies and is currently in its third printing. GF9 plans a UK printing, as well foreign language translations in the next year. The first Game Booster Firefly: The Game–Breaking Atmo, will release this month (see “‘Firefly: Breakin’ Atmo’“). 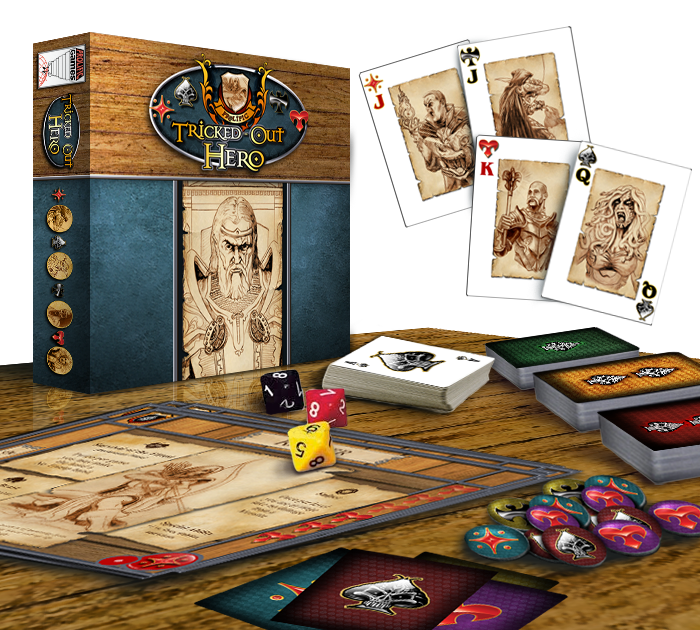 Tricked-Out Hero by Prolific Games is a tricking taking meets dungeon crawl experience where the hero must trick themselves out to delve deeper in the dungeon and power up your skills! Be careful that you don’t power up the monsters your are battling instead! Do you have what it takes to take on the dungeon and denizens that lurk inside? Hello and Merry Christmas to everyone! When I decided to do a Christmas List (which seems like a must for every board game blogger) I decided I didn’t just want to do a list of MY wants. I wanted to enlist the help of a few friends on our Google+ board game group who all submitted their top 10 wish list so I could get a good round about of games that would fit any type of gamer as much as possible as we all have very specific likes and dislikes in games. I also felt this was a great exercise in learning which board game publishers really put out a product that people want beyond the typical hot game of the week bru ha ha that quickly passes for most games. The list is comprised of the games (which ended up being 12 not 10) that were the most wished for on the post. The first two games got the most votes, the rest all received the same amount of votes and are in alphabetical order. I am not including any thoughts on this list as I feel the strength of the list is in the wanting of the games for the collections of other serious gamers. So without further ado, the Top 12 Club Fantasci Board Game Wish List! Caverna: The Cave Farmers is a worker-placement game at heart, with a focus on farming. In the game, you are the bearded leader of a small dwarf family that lives in a little cave in the mountains. You begin the game with a farmer and his spouse, and each member of the farming family represents an action that the player can take each turn. Together, you cultivate the forest in front of your cave and dig deeper into the mountain. You furnish the caves as dwellings for your offspring as well as working spaces for small enterprises. While the tasks on these Mystery cards (along with the locations of otherworldly gates, menacing monsters, and helpful clues) will often inform both your travel plans and the dangers you confront, you can find adventure anywhere in the world…even where you least expect it. It is during the Encounter Phase of each turn that players resolve combat or, alternatively, build their investigators’ personal stories by reading an encounter narrative from one of several types of Encounter cards. You might go head to head with a monster in Istanbul or find yourself in a tough spot with the crime syndicate in a major city. Maybe you will embark on an expedition to the Pyramids or research a clue you uncover in the unnamed wilderness. You may even find your way through a gate and explore a dimension beyond time and space. Should you fail an encounter, the cost is steep. If you are fortunate, you will merely incur physical or mental trauma. However, you might also be compelled to take a Condition card, which represents a specific injury or restriction gained throughout your journey, such as a Leg Injury or Amnesia. You could find yourself getting in over your head to acquire assets and receive a Debt condition – or maybe you’ll owe a favor to something far more insidious than a debt collector, and enter into a Dark Pact! Whatever your condition, you would be wise to find a resolution with haste; many conditions have a “reckoning effect” which, if triggered, ensure a much more sinister fate. All the while, the arrival of the Ancient One approaches. Its malign influence is manifested in Eldritch Horror as you draw Mythos Cards, which govern the appearance of otherworldly gates, fearsome monsters, and other ominous elements. Mythos cards keep your investigators under pressure, introducing new threats, even as the arrival of the Great Old One draws nearer! Since the investigators draw a new Mythos card each round, they’re certain to have their hands full battling foul creatures and following up on strange rumors, even as they work to solve their three all-important mysteries. Slap around your enemies and become the King of Tokyo! Play mutant monsters, gigantic robots and other monstrous creatures, joyfully whack your opponents, rampage the city and become the one and only King of Tokyo! Waterdeep, the City of Splendors—the most resplendent jewel in the Forgotten Realms, and a den of political intrigue and shady back-alley dealings. through trickery and negotiation must be taken by force! of Waterdeep, secret rulers of the city. Through your agents, you recruit adventurers to go on quests on your behalf, earning rewards and increasing your influence over the city. The players take the role of courtesans of the Nippon emperor and take on the role of caring for his Giant Panda by growing a bamboo plantation. Their mission: to farm parcels of land, irrigate them, and grow green, yellow or pink bamboo. In turn, they see what the weather brings and perform two actions from among those offered to them: get a new plot of land or irrigation channel, grow bamboo, feed the panda or draw an objective card. 12. Twilight Imperium 3rd Ed. Twilight Imperium Third Edition is an epic empire-building game of interstellar conflict, trade, and struggle for power. Players take the roles of ancient galactic civilizations, each seeking to seize the imperial throne via warfare, diplomacy, and technological progression. With geomorphic board tiles, exquisite plastic miniatures, hundreds of cards, and introducing a rich set of strategic dimensions that allows each player to refocus their game-plan, the original designer Christian T. Petersen has seamlessly incorporated the better qualities of other recently popular games to improve on the game-play of the original TI, making it at once perfectly well-rounded and pleasantly familiar to experienced gamers. Thank you to all who contributed to this list and for all your wisdom over the past year in our group! Ryan LaFlamme (www.thecardboardrepublic.com,) Craig Browser, Scott Hill, Alex Paulani, Jeromy French, Casey Harmon, Joe Mitchell, Michael Juneau, Brian Casey, Chris Goff, Neil Robinson, Jon Weber, Chris Shields, Jeff Horvat, Joshua Jackson, Zen L, Adam Day, Michelle Ross and Nate Parker.